Learning to bake can be exciting and fun! Featuring step-by-step instructions and full-color photos for over 30 sweet and savory recipes, this easy-to-follow book will help teach your child the baking basics along with finger-licking treats. Beginning with a quick primer on pan prep and necessary ingredients, Junior Baker offers easy recipes that make baking a cinch. 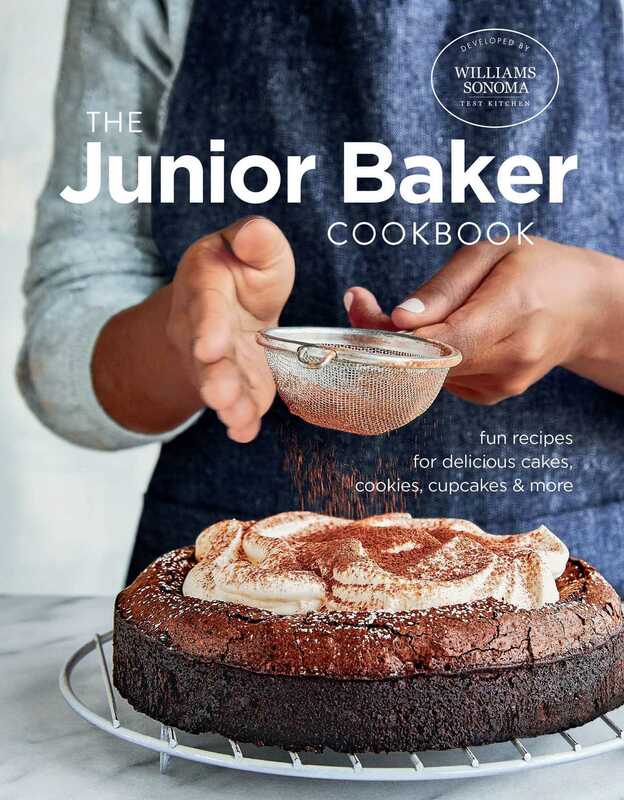 Junior Baker will inspire kids to have fun in the kitchen while providing simple instructions on how to bake up a scrumptious collection of sweet and savory favorites. Recipe highlights include: Lemon Poppy Seed Loaf Bread, Cinnamon Monkey Bread, Chocolate Tart, Lemon and Vanilla Cheesecake, Confetti Birthday Cake, Raspberry-Swirled Meringues, Cookies and Cream Cupcakes, Pumpkin Whoopie Pies, Brown Butter Rice Krispy Treats, Garlic and Herb Focaccia, Soft Pretzels and much more! This companion title to Junior Chef, this series will be a staple for your little kitchen connoisseur! Try splitting these scones and topping them with apple butter or thinly sliced apples. The sweet-tart fruit provides a counterpoint to the salty and savory flavors of the scones. 1 Preheat the oven to 400°F. Line 2 baking sheets with parchment paper. 2 In a food processor, combine the flour, baking powder, baking soda, salt, and pepper and pulse until blended. Add the butter and process until the mixture resembles coarse sand. In a small bowl, whisk together the egg and buttermilk. With the processor running, add the egg mixture in a slow, steady stream and process until the dough just comes together. 3 Transfer the dough to a large bowl and use a rubber spatula to fold in the cheese, bacon, and chives. Turn the dough out onto a well-floured work surface and divide in half. Form each half into a roundabout 8 inches in diameter and 1 inch thick. Cut each round into 8 wedges. Place on the prepared baking sheets, spacing the scones about 1 inch apart. scones to a wire rack and let cool completely. Store in an airtight container at room temperature for up to 3 days.